Natural, Glamour or Dramatic: Which lash set should you choose? Eye Design studio created four volume options for eyelash extensions: Natural, Glamour, Dramatic and Kim’s Effect. No matter how subtle or bold you like your lashes, our team can create custom styles for every set from Natural to Kim’s Effect. We are all experts at classic shapes like Doll and Cat, as well as more advanced techniques like Fox and Honeybee. 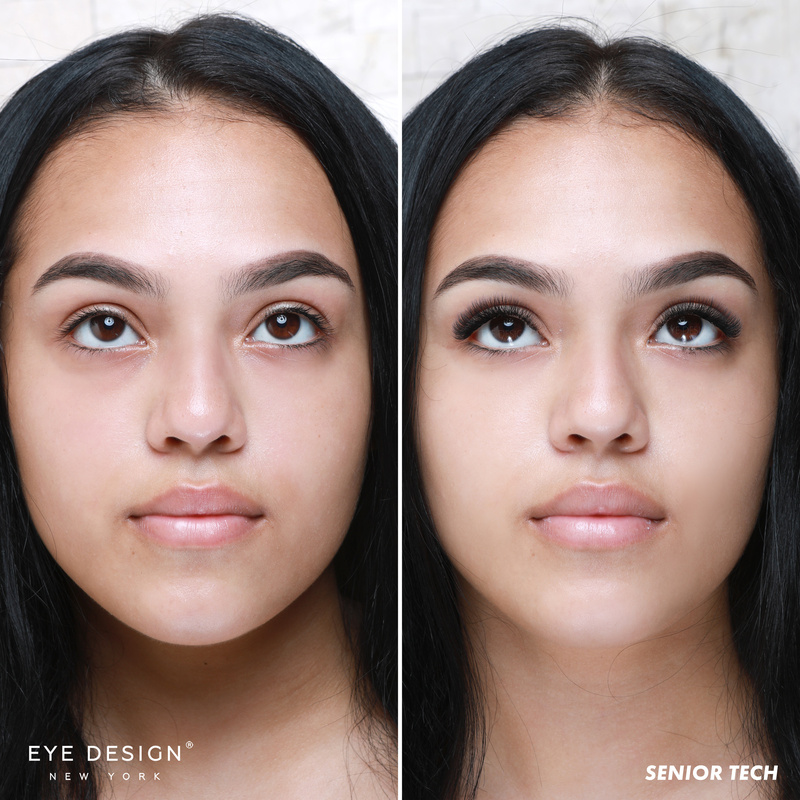 You may have also seen our exclusive new style known as Snapchat Effect, which gives clients photoready lashes IRL! Blonde clients or clients with fair skin may also love our brown eyelash extensions, or our brown/black mix. All lash sets are available in brown or brown/back, so be sure to ask us about it when scheduling your appointment. Our founder and Master Technician Nadia Afanaseva worked on this style behind the scenes after the success of her Kim’s Effect technique. She wanted to create something modern that still has elements of classic glam and a feminine twist. Snapchat Effect is available at Eye Design now, done exclusively by Nadia herself. Are you ready to be among the first to try it? For first-time lash-wearers, as well as those who prefer no makeup or “no makeup” makeup, we recommend our Natural set! It gives clients a subtle boost in volume, length and curl for that I-woke-up-like-this look. Our natural set is soft and flatters every eye and face shape beautifully. Those looking to slightly alter their eye shape may want to go for our cat shape, or doll/round. While cat elongates the eyes, doll and round open up the eyes and make them appear larger. One of our most common request is the Glamour lash set. It mimics the look of makeup, so it is ideal for clients who wear mascara or false lashes every day. Unlike makeup, however, our eyelash extensions never smudge or flake throughout the day. Instead, they last 4 to 6 weeks or longer (with proper care)! Nadia developed Kim’s Effect after countless requests from clients who wanted lashes like Kim Kardashian’s. It is exclusive to our studio; Eye Design is the only place in the world you will find the original Kim’s Effect lash extensions! With varied length throughout, Kim’s Effect is an ultra-voluminous flutter-y lash look. The pattern allows eyelid space to show through without sacrificing volume. This gives the wearer the freedom to create beautiful eyeshadow looks that aren’t masked by eyelash extensions. The extensions compliment all makeup looks perfectly. And if you are not into wearing eyeshadow, that’s fine! Our Kim’s Effect lashes are all you need to make a statement anytime, anywhere.